Look cool whilst staying shaded from the sun this summer; wear our colourful Logo Branded Sunglasses this summer. Pantone matching with this product means that there are over 5000 colours to choose from to ensure that your promotional product is perfect to suit your brand. Also, you can have your corporate logo printed in full colour on both arms – perfect to expose your brand for those summer days in the sun! But hold on! What’s cooler than a bright pair of promotional sunglasses in the summer? 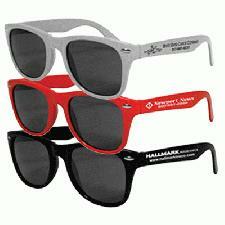 A pair of Promotional Sunglasses with a built in Bottle Opener, that’s what! And we have them here now for you to promote your brand in its full glory! There's more cool summer items where these came from! Check out our full range of Promotional Summer Products. For more information or enquiries on our Promotional Sunglasses, leave us a message and we will get straight back to you. Looking for somewhere to store your sunglasses when out and about? Our new Waist Bag is perfect for those outdoor adventures and is able to store all your personal items! Why not give it a try?